CareerWorks, the One-Stop Career Center in Brockton, Mass. run by UMass Donahue Institute, recently re-launched its website. 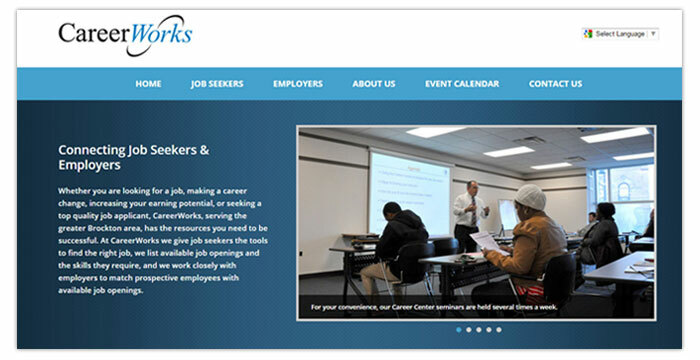 CareerWorks.org’s new “look and feel” reflects the center’s mission to serve both job seekers and local employers in the Brockton area by providing easy access to key information and resources. Whether a job seeker is visiting the website for the first time or has previously accessed the center’s online resources, the new website interface includes an easy to find daily calendar of workshops, job fairs, recruitment sessions, and recurring scheduled career center orientations. In addition to highlighting the services provided at its downtown Brockton location, the website also provides information about state-wide and national resources available for job seekers. The website also uses the Google Translate plug-in to serve speakers of Haitian Creole, Portuguese, and Spanish. Besides assisting job seekers, the center’s staff also builds relationships with local employers to better match their needs with the available workforce. "On the new website, our employer customers can now quickly and easily obtain information regarding our services, specifically in regards to the training process," said CareerWorks Director John Murray. CareerWorks is part of a statewide network of One-Stop Career Centers, serving job seekers and employers in Brockton, Abington, Avon, Bridgewater, East Bridgewater, Easton, Hanson, Stoughton, West Bridgewater, and Whitman. It is overseen under a charter with the Brockton Area Workforce Investment Board and is managed by UMass Donahue Institute.